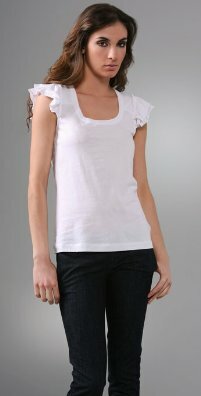 Juicy Couture's ruffle sleeve tee is from a previous season, so actual retail price is unknown. Old Navy has a similar tiered sleeve tee (although it's a vneck instead of the scoopneck on the Juicy version) which retails for $16.50. It comes in several other colors and you can click on the photo below to purchase or view. wow great dupe! I actually like the Old Navy version better (with the V-neck)! cute! i think v-necks are usually more flattering, anyway.